For Your Garage Or Man Cave?" Race deck flooring is a highly durable product manufactured in the U.S.A. from high impact copolymer. It is available in a number of popular styles, colors and designs. The product is reasonably priced and very simple to install, even if you are considering a patterned design of varying colors and pattern styles. Your editors are so impressed with the overall quality, pricing and simplicity of this branded product, we award it our coveted Five Star Rating. One of the things about this product that caught our eye was that it could be placed on a garage floor wall-to wall or it could be placed in just a parking area for a showpiece. It has an excellent tapered perimeter trim system for just that purpose. This product is about as versatile as it can be and makes for excellent garage flooring. The coloring goes all the way through each tile so color-wear-off is not an issue from heavy usage as it is with topical applications such as paint or powder coating. Each tile has a unique interlocking system (shown below) that is fairly easy to install by standing on an adjoining tile using your body weight to snap them together. When completed, the tiles form a homogenous garage flooring unit that resists movement and creeping on the concrete floor below. They can cover over unsightly cracking and failed topical finishes on the concrete garage floor below. The male and female interlock system shown in the photo above delineates how the 12" x 12" copolymer tiles lock together. The system comes with complete install instructions and recommendations to achieve a professional look and result. This product is a do-it-yourself dream! You can't go wrong if you follow the simple instructions, step-by-step. Compared to the cost of other garage flooring finishes, this product is very reasonably priced considering its appearance and durability record. RaceDeck® can make any garage floor look top notch! There are a variety of surface patterns and colors available in race deck flooring that can make your garage floor a one-of-a-kind showplace. You are only limited by your creativity in arranging what the brand has to offer. 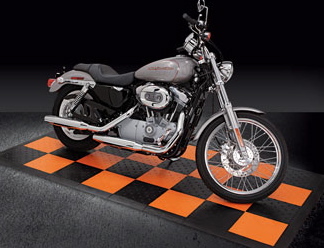 The Harley patterned tile is an example of how you can tie the flooring style to the branded machine sitting on top of it. The photo below gives you a very good idea as to how you can set-off one particular area of your garage floor for a showpiece item. In this view you can see the perimeter system mentioned above. If you are seriously considering a specialty finish for your garage floor, make sure you get pricing on the RaceDeck® package. You may be surprised how inexpensive it is. The product is sold by BigFloors.com and they often offer free shipping in the continental United States. Visit them today! This product offers great value for the buck!